And you sit there, listening to their doom laden missive, feeling frankly miserable. Not necessarily because you believe them but because they’re the fifth person to utter such remarks to you that day, and you’re not entirely sure you can cope with such depressing talk. A new parent listening to such things has to choose. Which route do you follow once that baby arrives? The pessimistic take the former. They decide that their own life is essentially over; that their prime directive now is simply to look after the child and live entirely by its whims and wishes. They believe it to such an extent that some people pretty much give up on everything they once held dear. All their hopes, dreams, goals and ambitions are buried away, never to see the light once again. The optimistic shun such an attitude. They know that times will have to be different, but where there is a will, there is most certainly a way. That having a child is not about giving up on your passions, but that you now have an additional person to share them with. When Samuel was born on a cold autumn evening in 2012, there was no argument over which way we’d approach life. The Thames Path isn’t really like any other major official long distance walking route in the UK. In most cases a trail which features copious amounts of concrete and which spends a substantial amount of its time wandering around highly urbanised areas, would be considered a complete and utter failure. Most trails are rather phobic about such things. They know that the average walker tends to want to get away from things; to see a bit of countryside, to escape the grime and noise. Even trails which run through the densely packed South East of England, such as the North Downs Way or Ridgeway, do their uttermost to avoid large conurbations, preferring to pass through villages and hamlets instead. On the other hand though, none of Britain’s other official long distance walking routes follow the course of one of the country’s most famous rivers. The River Thames is the longest river completely in England (the Severn is the longest in the UK but spends part of its time in Wales), and one which has had the biggest impact on the country. The waters of the Thames flow through the United Kingdom’s capital; a city which probably would never have grown to the size it is now had it not been for the power it derived from being a major port. At one time the river was vital for trade; goods from around the world filled warehouses on its eastern banks, whilst its western section was a valuable trading route for transporting commodities to the capital from across the country. In more recent years the railways and roads took over from water transport inside the UK, and containerisation – where commodities began to be transported around the world in large metal boxes that could be quickly unloaded from cargo ships by giant cranes – saw London’s ports slowly close down. The old docks and harbours simply weren’t suitable for the new way of shipping goods, and one by one they closed down with business moving out to new mega-ports out at the east. After centuries of use, the Thames began to fall slowly into decline. But even in the late 19th century, thoughts were turning to giving the Thames a new role; recreation. The increasingly redundant tow paths could, it was suggested, be used for the purposes of leisure. It would take many years but finally in the 1970s the Ramblers Association and the relatively young River Thames Society persuaded the powers that be to commission a feasibility study on a new long distance walking route. It took some time, and 16 miles of new tow path route had to be built, but the Thames Path National Trail eventually opened fully in 1996. And it’s all there waiting for people to come and walk on it. And many people do. If the Thames Path isn’t the most used National Trail in Britain, then I can’t think what is. True, most of the people using it aren’t doing the whole thing, but it’s busy all the same. 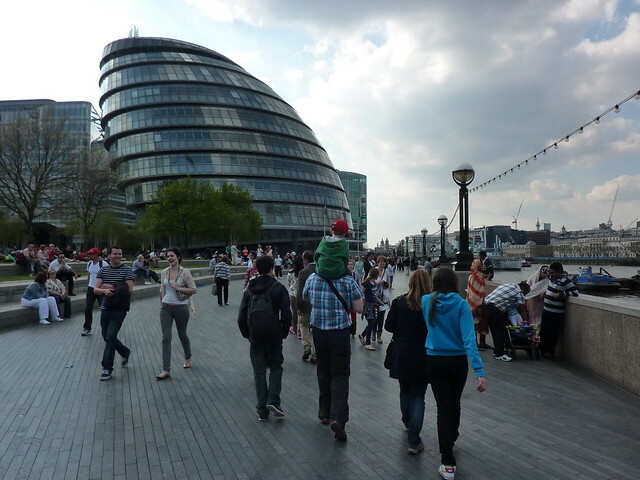 The section through the capital is regularly packed with tourists who take a stroll along the South Bank on a sunny day, and take in all the sights: Tower Bridge; the Tate; St Paul’s; the Houses of Parliament. It’s rare to walk along the banks of the Thames in London and not find a tourist eagerly having their photograph taken with an obliging police office at least somewhere. Yet despite living in London for fourteen years, the Thames Path was a trail I’d barely touched. A few miles here, the odd stroll there. Every now and then I’d suggest walking the whole of the route to my partner Catherine; sometimes in jest, sometimes seriously. But we always came to the same conclusion. Why head out on the Thames Path when there were proper walks to do? Walks with hills and fine countryside. Walks with cute little villages with thatched cottages and hanging baskets, and a pub that serves a massive ploughmans served with lashings of pickled eggs. Not that the Thames Path doesn’t have these things in some parts – especially as it makes its way to the source of the river – however you have to go through the urban jungle too. But then something changed. Sam was born, our first child. And hill walking with a recently born baby isn’t particularly the easiest thing to do. You can’t push a pram up a Wainwright after all. The West Highland Way just isn’t going to work if you’ve got a baby strapped to you in a Baby Bjorn. The Thames Path on the other hand, well that is pretty good for prams and buggies. Lots of nice flat pavements and riverside views. So we poured over the maps and guidebooks and came up with our plan. 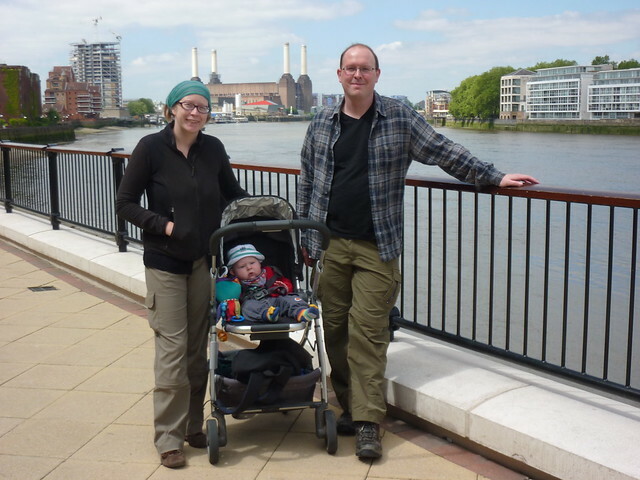 We’d start off at the eastern end of the Thames Path, at the Thames Barrier, and walk to the source. For the London bits where there would be excellent paving, we’d push Sam down in his pram, and later his buggy. Then when we got to the more rural sections, where perhaps the grass would get in the way of the buggy wheels, we’d opt for some sort of back carrying device. Or whatever. We’d work it out when we got to that problem. We’d start with the easy bit and get harder. We’d learn on the bits close to our home how best to walk with a small baby, and keep on learning as he got bigger and bigger and bigger. We had a plan. A plan for a walk we’d be able to do together as a family. True, only being a few months old, Sam might not particularly remember this when he got older, but he’d be able to say he’d started his first National Trail before he could even walk. We were sure that when he grew up and learned about this, he’d be very proud. Next time: Thames Barrier, a white elephant, a former white elephant, crying baby and a brewery. Battenburg anyone? I think I’ve just made a split second decision to do this! Let’s hope my resolve lasts … looking forward to reading more. It’s certainly worth doing – from what I’ve seen so far anyway! I did it solo, in the same direction as you. As a novice walker, it was much tougher than I expected, but very rewarding (there was pain! Emotional and physical! How can you experience love and hate simultaneously for the same experience??!). Looking forward to finding out how you got on! We are in the planning stages to do the Thames Path walk so came across your website whilst looking for info. We live in Abbey wood. The Thames Path is within easy walking distance so we have done all the way up to London already but it’s time to get serious! Just wanted to say that your Thames Walk posts are great reading, witty and informative. First Published: 7 November 2013. Last Updated: 11 July 2016.